Jack and I stayed home yesterday, while Dave and Luke braved the 45 mile an hour winds at Eldora. Jack had me making a list of activities before I was even out of bed. By about 10:00 am we had everything crossed off and I wanted to just sit for a minute. Jack wanted to glue so I decided to work on my scrapbook while he made a collage. 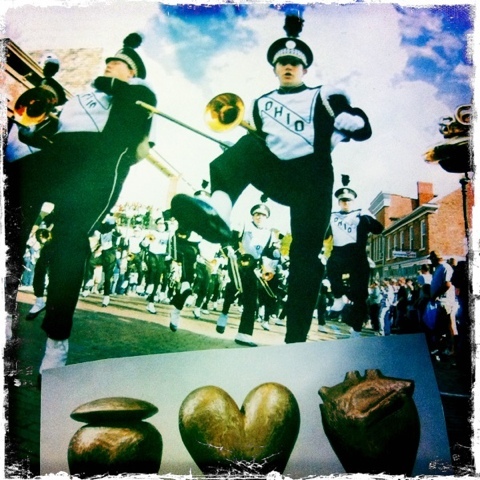 The top two items in the recycling bin were the latest Anthropologie catalog and the Ohio University Alumni magazine. We decided not to risk it, but just placed the hearts there for a second to take the photo. This entry was posted in Jack, Projects, Uncategorized on January 22, 2012 by metamegan.